Life is busy and with so many competing demands and it can be hard to find the time to focus on your long-term lifestyle goals. When it comes to something as important as managing and growing your wealth, it makes sense to speak to a licenced Financial Planner. With over $65 million in assets under management, we have the expertise and resources required to help you reach your financial goals. Whether you’re just starting out or approaching retirement, our Financial Planning team will help you navigate through the financial planning process, understand your goals and objectives and provide you with a written plan designed to provide you with financial peace of mind. We were awarded the Outstanding Quality Award at the 2015 National Count Conference. As your trusted financial adviser, we take the time to get to know you and understand your goals and objectives, to enable us to provide you with tailored, specific advice in relation to the types of investment products that can assist you in achieving your short and long term financial goals. We leverage off our relationship with Count Financial to obtain up-to-date, detailed research and information in relation to the financial markets, and the various types of investment products available including cash deposit accounts, wrap accounts, managed investment platforms, direct shares and geared investments. Our approach is to design a diversified, quality investment portfolio that incorporates an appropriate mix of defensive and growth investments from the key asset classes, specifically designed to suit your investment profile and financial goals. Defensive investments - The most common defensive investments are cash and fixed interest investments. These investments aim to provide regular income and stable returns. In return for decreased volatility, defensive investments don’t usually grow in capital value and returns are generally lower than growth investments over the medium to long term. Growth investments - The most common growth investments are shares and property. Growth investments can provide income as well as an increase in capital value. While returns may fluctuate over the short-term, growth investments have the potential to produce higher returns than defensive investments over the medium to long term. A managed fund operates by pooling together the money of many individual investors. This money is then invested by a professional fund manager in different asset classes (eg shares, property and bonds) in line with the fund’s stated investment strategy. For some investors, managed funds provide the right amount of control without the time-consuming hands-on management required by direct investing. What are your financial objectives – do you want income, capital growth or both? What types of asset classes do you want to invest in? What role (if any) do managed funds play in your investment portfolio? Should you reinvest your income or harvest earnings? What about market volatility – will this affect your investment choices? To assist you further, we have set out below some information in relation to the types of investments that you may be interested in. You’re in the hands of professionals: investment professionals look after your investment and have access to information, research and ideas not always available to the general public. Regular investment plans: enabling you to regularly contribute to your savings and growing your wealth. You decide the investment style: you can choose whether you’d like your funds to deliver income or growth and have proven professionals working towards delivering that result. You can reinvest distributions: reinvest your investment earnings back into the investment enabling you to buy more units and take advantage of compounding without the need to outlay additional money. The fund must pay all income and net realised capital gains to unit holders as distributions. A shareholding is part-ownership of a listed company. The shareholder receives dividends or income from their share investment and the company is able to raise valuable equity capital to fund its growth and operations. Shares can be sold on the stock exchange and a potential capital gain realised if the share price rises – creating an opportunity for both income and capital growth. Flexibility and liquidity: shares offer real-time pricing, this means you can buy or sell your shares easily and quickly at any time whenever the market is open. Low cost: shares are typically a cheaper investment option to manage due to lower operating costs and management fees. Capital growth and dividends: shares offer capital growth and maximum control over capital gains realised, as you can make the decision when to sell. Franking credits: Australian shares often include franking or imputation credits, which means where the company has already paid the tax on their profits, if you are an Australian resident for tax purposes you can use these franking credits to offset tax payable on your other income. We take the time to understand your current situation, what type of investor you are and where you want to be in 5 or 10 years time. We undertake regular reviews of your investment portfolio to ensure it remains suitable to your financial needs and objectives. Contact our team to make an appointment today. General advice warning: The advice provided in general advice only as, in preparing it we did not take into account your investment objectives, financial situation or particular needs. Before making an investment decision on the basis of this advice, you should consider how appropriate the advice is to your particular investment needs, and objectives. You should also consider the relevant Product Disclosure Statement before making any decision relating to a financial product. Are you, or your children, young, just starting out, want to get in early and start investing, but don't have a lot of money? With our Smart Savers Plan, establishing an investment can start with as little as $1,000. Once you take the first step to contact us, the rest is easy. Whether your long-term goal is to save and invest for a house deposit, an overseas trip or your ultimate retirement and financial freedom, starting young and investing regularly is the answer. By implementing a regular investment plan, you will be able to take advantage of 'dollar cost averaging'. When you invest a set amount at regular intervals, sometimes you will purchase units or shares at a higher price, and sometimes at a lower price. Over time, this spreads out your costs and averages the value of the assets you are purchasing. Investing in managed funds can provide you with long-term growth in a diversified environment which reduces the volatility. Compounding is when you earn interest on your interest. The more you have, the more it will continue to increase. Investing builds wealth over time. If you need the money now or even in the next 3 years, then investing is not for you. Property is only one asset class and it does not consistently outperform Australian and International Shares. Checking your investments constantly and reacting to what you hear in the news is not a sound, long-term investment strategy. When you buy direct shares, you are purchasing a tiny bit of an actual company. What do you actually know about their objectives and strategies? Diversification across a number of shares via a managed fund will provide significantly less volatility than one individual stock. Your investment value will go up. And down. The market will not always move as predicted and history will not dictate the future. The only consistency in investment is the concept of investing for the long term. Investing is not free. There are fees for both advice and investment services. However, we provide transparent disclosure before you invest and you may also be eligible for a tax deduction depending on your circumstances. When it comes to building your nest egg, time is your greatest asset. Our financial advisers have the skills and experience to help you, and your children, get started now to prepare for a financially-sound future. Contact us on 07 3217 2477 to arrange an obligation and cost free initial appointment with our financial planner. We can review your current insurances (held inside and outside of super) and provide you with advice in terms of your insurances requirements. As authorised representatives of Count Financial, we can provide you with insurance quotes and implement insurance policies that are appropriate for you and your family. What types of personal risk insurance are there? Pays a lump sum if you die or suffer a terminal illness so your family can continue to maintain its standard of living or pay off any debts. Pays a lump sum if you suffer a disability and become totally and permanently disabled. Pays a monthly income to support you if an illness or injury means you’re unable to work. Pays a lump sum if you’re diagnosed with a specified medical condition (such as heart attack, stroke or cancer). Life insurance can help provide financial assistance for a family if they lose the homemaker or breadwinner. In a business situation, life insurance can help protect against the loss of a key employee or business partner. Income protection insurance, also known as salary continuance insurance, pays a monthly benefit of up to 75% of your pre-tax salary if you are disabled due to an illness or injury for longer than the nominated waiting period. Income protection benefits begin after a predetermined waiting period (eg 30 days, 90 days, or two years) that you nominate when you take out the cover. Generally, a longer waiting period means a lower premium however it also means you’ll have to wait longer to receive your first benefit payment. The policy will continue to pay the benefit for as long as you remain unable to work up to a maximum predetermined period. This can be a set timeframe such as two years or age based (eg. up to age 65). By getting to know you and understanding your personal circumstances and lifestyle goals, we can help decode the various insurance policies and find the right mix of cover to suit your needs. Based on your current investment portfolio and earnings, we can ensure your level of income is protected should the unexpected happen - so your family have financial security and you can recover in comfort. We have set out below some information on the different types of insurances that may be appropriate for you and your family. What kind of insurance do you need and why is it important? As your lifestyle and financial position change over time, so do your risk insurance needs. Choosing the right type of personal risk insurance also depends on your current income and your existing financial commitments. Before you choose any form of insurance it’s important to ask yourself how long you would be able to survive without any income before you need to take drastic action like selling off your investments or even the family home. As your lifestyle and financial position change over time, so do your risk insurance needs. For example, during the years when you are supporting a young family or paying off a large mortgage, you will likely want more protection than later years when you may have downsized homes and your children are in the workforce. 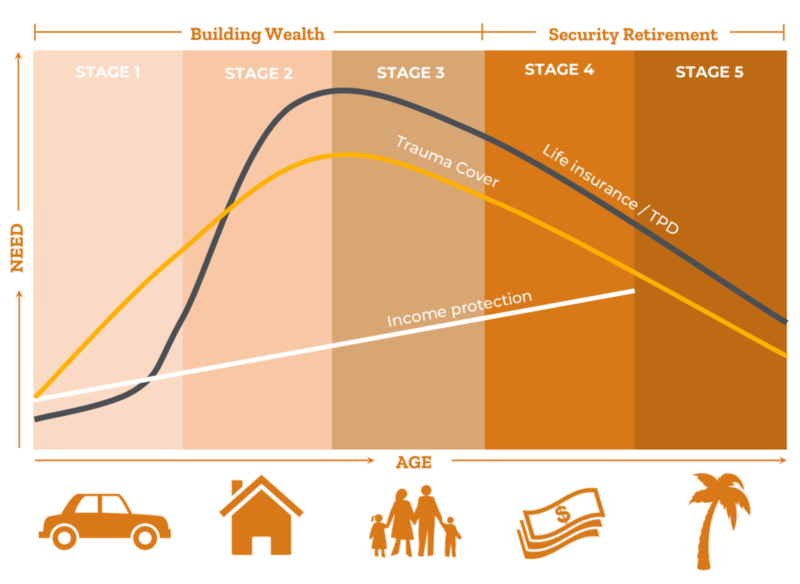 The diagram shows what type of insurance may be required most during each phase of life. Acquiring life insurance through your superannuation fund can provide some tax concessions which are not generally available for life insurance policies held ‘outside super’. Not all types of personal risk insurance is available through your superannuation fund. New rules came into effect on 1 July 2014 that restrict the types of new TPD and income protection policies that can be purchased through superannuation, while new trauma policies are generally prohibited. 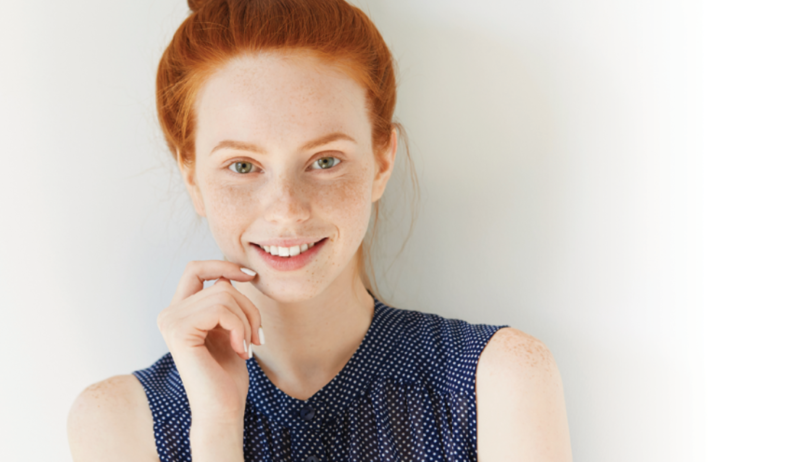 We are happy to provide a free initial review your current insurances (including any policies you may have within your superannuation fund) and provide you with advice in terms of what cover is appropriate for you. Contact our team of Financial Planners to find out more. With improved life expectancy, Australians can look forward to a much longer retirement than past generations. Enjoying a lengthy retirement, however, may cost more than you think. We can help you make sense of this by projecting your final savings at retirement, determining your future income potential and taking you through your retirement options. for social security benefits from the Australian Government to supplement their income and access extra benefits including discounts on public transport and some pharmaceuticals. Effective retirement planning can be complicated – so it’s important to get the right advice to ensure you understand how all these choices work and consult with us to determine the right combination for you. An effective transition to retirement (TTR) strategy can help you ease into retirement without compromising your lifestyle. It can even help boost your super and offer greater flexibility as you move towards retirement. Why is a transition to retirement strategy worth considering? A pre-retirement pension lets you draw a regular income from your super savings. You can continue making salary sacrifice contributions or personal deductible contributions (if you are self-employed) to your super while you’re drawing on it. A pre-retirement pension may also give you the option of reducing your hours without the need to reduce your income. However, a pre-retirement pension isn’t always the best option for everyone. we can help you decide on whether a TTR will suit your circumstances and income objectives and how you can ensure your super will last well into your retirement. You’ll also need to check with your super provider, as not all funds offer pre-retirement pensions. Are there any tax consequences of how your assets are distributed? Do you have a binding death benefit nomination for your superannuation? Whether an enduring power of attorney and/or enduring guardian is appropriate for you? If you own a business, you may also need to consider implementing appropriate business succession plans. A Will is a legal document that sets out who is to receive your assets after you die. A Will may appoint a guardian for any children you have under 18 years of age and also state your wishes regarding your funeral and burial. Your solicitor can help you draft a legal Will. This may involve working with your financial adviser to ensure the appropriate financial structures are included. If you die without a will (also known as ‘dying intestate’), your assets will be distributed according to the laws of the state or territory in which you lived at the time of your death. This may not be the way you would have wanted your assets distributed. Also, if you have children under 18 who are left without a parent and you don’t have a valid will appointing a guardian for them, a guardian will be appointed under the laws of the state or territory in which they live. This may not be the person you would have chosen to bring up your children. Both these reasons make it vital for you to have a valid Will and keep it current. It’s important to ensure your assets are owned in the appropriate way as early as possible to avoid being caught by stamp duty or capital gains tax (CGT) if the ownership structure needs to be changed at a later time or transferred to a beneficiary after your death, Many assets, including personal possessions, property, money in bank accounts, shares and managed funds will become part of a person’s estate upon their death and are governed by their Will. What assets are not governed by a Will? Jointly owned assets or property can generally be held in one of two ways – either as joint tenants or as tenants in common. If an asset is held as joint tenants, on your death the surviving joint tenant automatically acquires ownership of your share of the asset. The asset won’t form part of your estate and can’t be dealt with under your Will. However, if an asset is held as tenants in common, your share of the asset becomes part of your estate and can be dealt with under your Will. If you own assets via a company or trust, your estate plan needs to address how that control will be passed on to your beneficiaries when you die. In the case of a company, this will involve considering who will be entitled to any shares you own in the company on your death. It may also require an examination of any rights you may have under the constitution of the company to appoint directors. In the case of a trust, you will need to examine any rights you may have under the trust deed to appoint a replacement trustee or to wind up the trust and direct how its assets should be disposed of. If the trustee is a company, it will also involve considering who would be entitled to any shares you own in that company. Many people wrongly assume that their superannuation will pass to their beneficiaries according to their Will. In fact, this will only happen if your legal personal representative (on behalf of your estate) is the recipient of your superannuation death benefit. Legally, your superannuation fund can pay your death benefit to any of your dependants (which include your spouse, children, financial dependants and interdependent relations), or your legal personal representative, often at the discretion of the fund trustee. Many (although not all) superannuation funds allow you to override this situation by making what is known as a Binding or Non-Lapsing Death Benefit Nomination. This is a written nomination made by you, which directs your superannuation fund on how to pay your death benefit. There are several types of death benefit nominations, including nonbinding options. We can help you decide which is best for your situation. As part of your estate plan, you also need to consider the taxation implications of how your death benefit is dealt with. Lump sum payments paid to dependants (as defined under income tax laws) are tax-free. Part or all of death benefits paid to non-dependants are subject to tax. When you take out a personal life insurance policy (outside super), you generally have the option to nominate a beneficiary for the policy proceeds. Any payout under the policy will be paid directly to the nominated beneficiary (or beneficiaries), by passing your estate. As such, your estate plan should factor in who you have nominated as the beneficiary of your life insurance policy. It may be prudent to nominate a beneficiary or to have a third party such as a spouse or partner as the owner of the policy rather than simply having the proceeds paid to your estate (unless a testamentary trust is required). This is because a life insurance company will generally require a grant of probate to make a payment to a deceased estate for life insurance proceeds of $50,000 or more, whereas in the case of a nominated beneficiary or a third party owner, usually all that is required is a copy of the death certificate. A testamentary trust is a trust established by someone’s Will. It comes into existence only when that person dies. Including a testamentary trust in your Will can be useful for making tax effective distributions to beneficiaries under 18, caring for children or a dependant who is incapacitated, and preventing beneficiaries from inappropriately spending their inheritance. If you are worried that you will be unable to manage your own affairs, you might consider appointing an enduring Power of Attorney (PoA) and enduring Guardian. Granting someone a PoA means they can legally act on your behalf in relation to financial matters. Unlike a general PoA, an enduring PoA continues to apply if you lose mental capacity, meaning you can appoint someone you trust to look after your financial affairs if you’re no longer able to do so. An enduring Guardian is able to make health or lifestyle decisions for you if you’re no longer able to do so. The disposal of assets in accordance with your Will may have tax consequences, including CGT, that you should consider when drafting your Will and creating your estate plan. There are many strategies you can use to help make your estate plan as tax-effective as possible for your dependants and beneficiaries. The proceeds of an insurance policy paid from a superannuation fund are tax-free if paid to tax dependants. Distributing an asset (rather than the proceeds of the sale of that asset) to a beneficiary can defer any CGT liability. Using discretionary trusts can help minimise the tax a beneficiary pays on receipt of an inheritance. Using testamentary trusts can be an effective way to provide an inheritance to young children. We can help you investigate which strategies may be appropriate for your personal situation. Contact our team to find out more. What care and services are provided? All aged care homes must provide a specified range of care and services to residents, according to their individual needs. For residents with higher care needs, services will also include the provision of special medical equipment, such as wheelchairs, basic medical and pharmaceutical supplies, nursing and therapy services. While some aged care homes specialise in a particular level of care, many offer a range of care levels so that residents can stay in one location when their care needs increase. Before a person enters residential aged care, they must be assessed and approved by the government’s Aged Care Assessment Team (ACAT). ACAT helps older people and those who care for them, decide what kind of care will best meet their needs when they can no longer manage on their own. ACAT is made up of a range of health care professionals, including doctors, nurses and social workers. ACAT thoroughly assesses a person’s situation and care needs, provides information on suitable care options and can help arrange access or referrals to residential or home care in the local area. You can arrange an appointment with the ACAT closest to you by accessing the Government’s aged care portal ‘My Aged Care’ at www.myagedcare.gov.au or calling 1800 200 422. Alternatively, your doctor can make an appointment with the ACAT in your area. Residential aged care is a complex area. Getting the right professional financial advice can make all the difference in ensuring your assets and income are structured effectively, minimising any changes to your pension payments and ensuring you have sufficient income to support your lifestyle and care needs for a comfortable stay. Contact us if you would like to know more about residential aged care. Click here to learn more about our financial planners, the services we can provide, and the products we can recommend.